Being a blogger user, there is no assurance that your blog is safe from removal, that’s the price of using the platform for free. Since, your site is hosted at Google servers. Therefore, if your site does not comply with their Terms and services they will delete your site without even giving a second chance. You may have heard from many co-Blogger users that their websites are getting vanished overnight. As a Google blogger, there is no way of retrieving your deleted blog. The only thing you can do to protect yourself is to take a backup of your site. In this Article, we will show you how to take backup your Blogger Blog. Probably this is the price of using this platform for free. Just imagine the feeling of a person who spends days and nights in putting up his website, and suddenly Google removes his site due to some violation in terms. Things cannot get worse than that. How To Backup of Posts, Pages and Images? 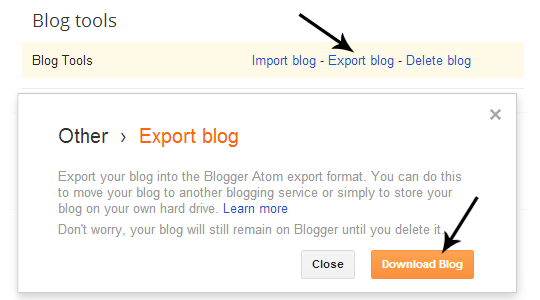 To Backup your website go to Blogger.com >> Settings >> Other >> Export your blog. Now a new window will appear, just select the orange “Download Blog” button and a file will be downloaded which would be in “XML” format. That file possesses all the data and details about your blog including posts, images, and pages. The downloaded file can be used on WordPress, or any other popular platform. If anyone is wondering how to take back up of their template, then he can go to Blogger >> Template >> Backup/Restore. Now press “Download the full template” button and template is successfully backed up. The downloaded file would be in XML format and it cannot be used on any other platform except Blogger. That’s all folks, now your blog is successfully backed up. In the future, if your site got deleted, then you can use this back up and can migrate your whole site to WordPress without even losing a single Search engine ranking. By using 301 permanent redirects, we can easily redirect all the traffic to the new self-hosted WordPress site. 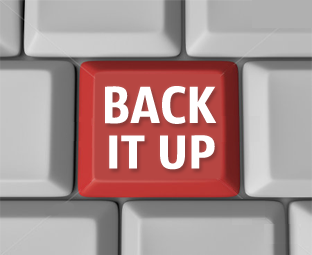 However, without backup you have to give a kick start to your career once again. Similar issue happened to wordpress users also especially free ones and that is why this article sound so meaningful. Very nice brother I have also written about it. The posts are good but i feel you have started writing on a very basic level. You are right Tanmay. MBL is becoming kids place. Please syed, don't be hyper. You have to accept this. Our Motive is to Help beginner Bloggers The reason we have changed our slogan to "Beginner Guide For Bloggers". We are working on basic level to help some new guys who don't get any chances to show their Talent. The reason we have released few tutorials dedicating to beginners and in coming days we would cover each and every topic no matter it's level is Basic or Not. @ syed you are doing a great job man , kisi or ki baaton main mat aao hum jese logo ko bohat kuch sekhne ko milta hai ap se , keep it up !! Now a unique way to take your blog post by date, month or yearly is blogger backup software. It is easily available at here! Thanks for this helpful information. Can you tell me - does the backup include copies of draft posts? If I do this every day, do I still need to save copies of my posts in MS Word, or would I be able to retrieve them all from the download? Thanks! Nope it doesnot includes backup of draft posts. Excellent, I used to think what happens to my 200k pageviews blog get deleted by blogger team without any notification. Thank god I reached this page through buysellads advertise page. I immediately backed up my blog which is just 3.2MB in size.